This is a follow-up to my mini-review of the new Radio Shack model 2000669 receiver. Overall, I continue to be quite happy with this receiver, however, I think the loss of memories and time when replacing batteries is annoying. So, I did a simple mod to the radio to help prevent having to re-program everything after installing new batteries. 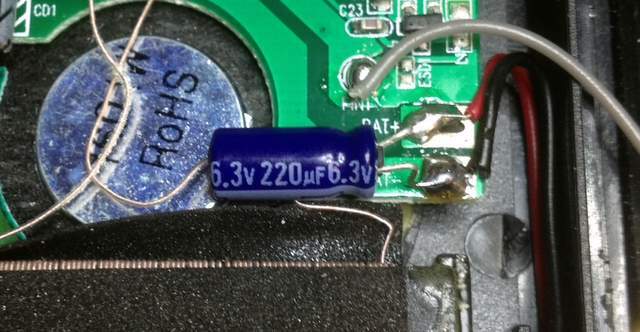 I found that there was enough space within the case to tack a 220 µF 6.3 V electrolytic capacitor across the pads on the PC board where the battery leads are attached [see the photo below]. Adding a series resistor to limit current flow might be better, but this simple change seems to be OK. The mod won’t prevent long-term memory loss, but it will keep enough voltage on the circuit for a quick battery change (especially if you change one battery at a time). The radio is not actually altered, and the mod can be easily removed if desired. Many thanks for creating and documenting this simple mod, Mike! On a side note, I remember when RadioShack used to pride themselves on having a full line of products that could maintain memory if batteries were removed or in case of power outage. RadioShack badged VCRs, receivers, radios and clocks all had this feature in the 1990s, at least. 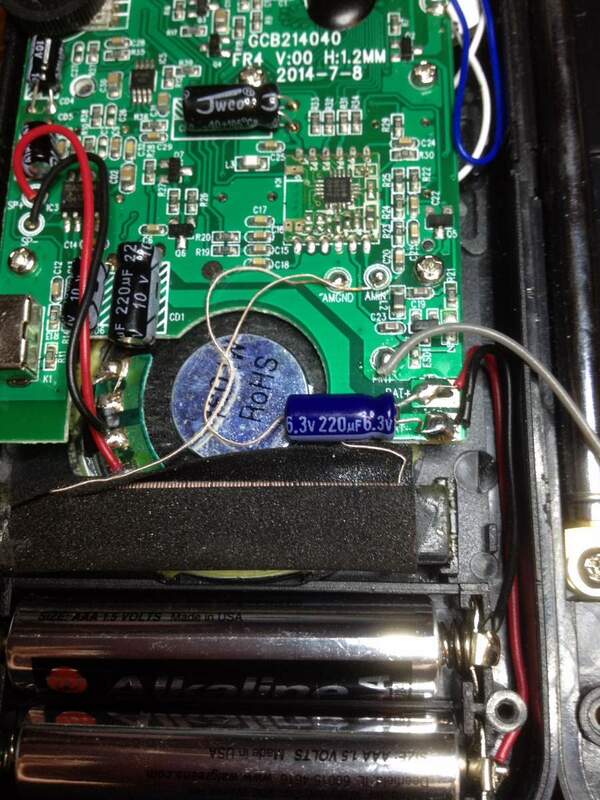 This entry was posted in How To, New Products, News, Radio Modifications, Radios, Uncategorized and tagged Radio Shack, RadioShack Model 2000669, RadioShack Model 2000669 Mod, RadioShack Model 2000669 Modifications, Shortwave Portables on December 3, 2014 by Thomas. Attached [above] is an annotated photo of the RS radio’s PC board. As you’ll see, there is a mystery “blob” chip, which probably handles the DSP functions. The TDA2922 is an audio amplifier, but I couldn’t find data sheets for the other ICs. Maybe some of your readers can help. There is one pad prepared for an additional chip, so additional functions might be possible. By the way, I discovered that if you remove the batteries, the memories and clock have to be reset; which is unfortunate. Overall, for $30, I’m quite happy. Mike, thanks so much for cracking open your brand new radio so that we can take a look inside. The “blob” chip does most likely handle DSP and I bet it’s not a SiLabs chip since (I believe) they are typically labeled. Perhaps readers can chime in with additional information? This entry was posted in News and tagged Radio Shack, RadioShack Model 2000669, Shortwave Portables on November 25, 2014 by Thomas. I picked one up today, and overall, I’m impressed. It does have complete coverage from 2.5 to 26.1 MHz as advertised, and overall, it has very good sensitivity and adjacent channel rejection for a small portable (in fact, the best I’ve heard from such). Sure sounds like some sort of DSP filter is involved. Reception is at least as good as my old Grundig Mini 300 and much, much better than a Degen DE22. Clipping an external long-wire antenna did not cause overloading (I was very surprised by this). AM BCB reception is actually quite decent: I was able to listen to several distant stations that were only 10 kHz from local ones. Audio is OK but not great, and the case does not stand up stably. I guess you can’t expect too much from a $30 radio. No case or earbuds are included. By the way, if you go to a local Radio Shack store, be sure you get the internet price. We have two stores near my house; both had the radio marked as $39.99 instead of the $27.99 online sale price. The guys at the first store said “sorry, we can’t change the sticker price.” No sale. So, I went to the other store. When I pointed out the web price to the young women helping me there, she said, “this isn’t right” and called her manager over who overrode the store price with the cheaper one. So, who makes this radio? Good question. The back of the case says “Custom manufactured in China for Radio Shack Corporation.” Maybe Tecsun? Sounds like this may be a great portable for the glove compartment of a car, or to keep in your backpack/briefcase. Thanks, Mike, and please share any other comments about this radio as you use it. 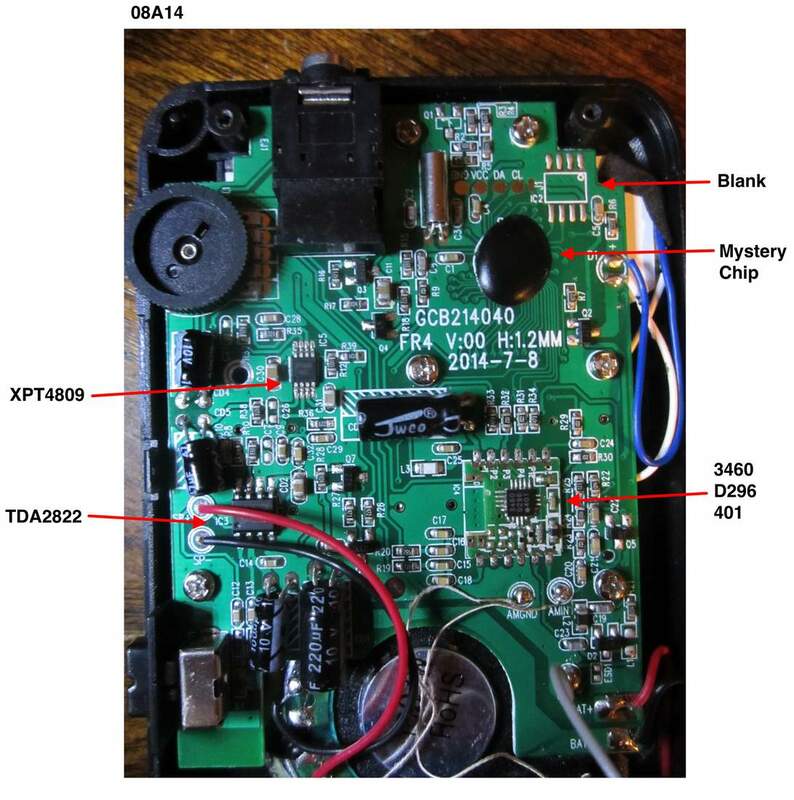 This entry was posted in News, Reviews, Shortwave Radio, Travel and tagged Portables, RadioShack, RadioShack Model 2000669 on November 23, 2014 by Thomas. 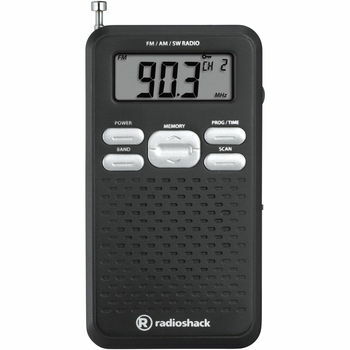 New RadioShack portable AM/FM/SW radio? Very good question! Though I haven’t been inside a RadioShack in a couple of months, I’ve never noticed this portable on their shelves. In fact, I don’t even recognize the form factor as a re-badged Tecsun or Degen. Has anyone purchased the model 2000669 from RadioShack? This entry was posted in New Products, News, Radios, Shortwave Radio and tagged Portables, RadioShack, RadioShack Model 2000669 on November 22, 2014 by Thomas.